We’d love your help. Let us know what’s wrong with this preview of Mexico City by Jim Johnston. To ask other readers questions about Mexico City, please sign up. Probably the best travel guide I've ever used (complemented by my googlemaps - I guess it's worth noting there aren't many navigable maps in the book itself). Full of all the relevant info you could want, and so many great walking route suggestions. I'd be in raptures about Mexico City anyway, but this book does the city justice! Good info for my trip, but the maps were completely insufficient. Also it would have been nice to have approximate time/distance for walking tours. 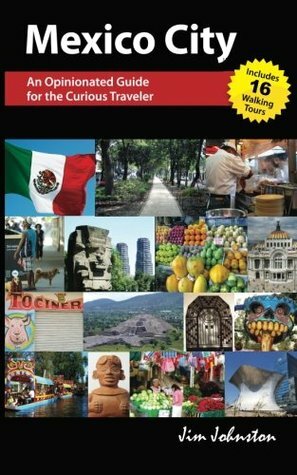 I do not think this could be used as your only guidebook for Mexico City. I supplemented with Lonely Planet: Mexico. A unique Mexico City travel guide that takes you to places the BIG guides don't. Focusing on the Centro Historico, the downtown walking tours described at the back of this guide are a must. For more up to date ideas, check out author Jim Johnston's blog. Top-notch travel guide to the DF.